‘If there was free education Mlungisi would be alive and at school,’ said EFF KZN chairperson Vusi Khoza, eliciting loud cheers from students. 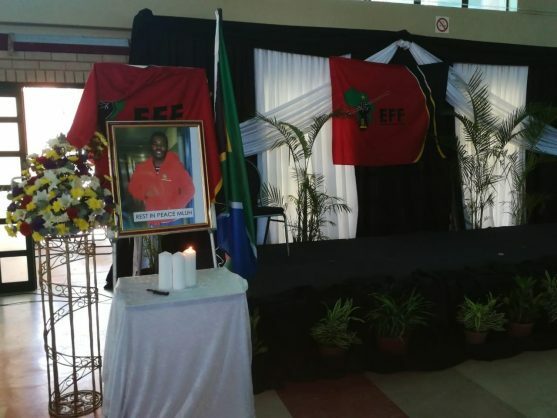 The leader of the Economic Freedom Fighters (EFF) in KwaZulu-Natal told those attending a memorial service for slain student Mlungisi Madonsela that the 20-year-old was killed because of the African National Congress’s (ANC) refusal to provide free tertiary education. “We are here and our hearts are bleeding because one of our own is dead, because the ANC and by extension one of its deployees decided to murder him,” said EFF KZN chairperson Vusi Khoza, to loud cheers. Khoza was speaking at the Durban University of Technology (DUT) Ritson Hall today. The venue was filled with students, many having to listen to the various tributes from outside. Madonsela’s family was also in attendance, as were DUT senior managers and staff. “The ANC and government lied, they promised us free education and it’s not free. If there was free education Mlungisi would be alive and at school,” said Khoza, again eliciting loud cheers from students. Madonsela, an EFF supporter, was shot just outside DUT’s Steve Biko campus on Tuesday last week. He was allegedly part of a group of about 30 students – armed with bricks and rocks – who tried to storm an administration building to gain access to the institution. He was allegedly shot during an altercation with a security guard and later died at the Durban City Hospital. EFF students who accompanied Madonsela to the hospital claimed staff refused to treat him because no one could sign for the bill. DUT staff members were also severely injured during the violence – allegedly by students – and had to be hospitalised. The incident took place during a call by various student leaders for a “total shutdown” at tertiary education institutions throughout the province. They were protesting the cost and state of student accommodation, late payment of government funded loans and slow registration processes. Khoza said that during the apartheid student uprising, the power behind the gun was “a white man and a white government”. Today, he said, “izinkabi” (hitmen) were being hired to kill students. “We call upon the police to do their job and ensure those murderers are in prison,” he said. Khoza then called on students to “exercise calm, because EFF is here”. “We will realise free education in this lifetime because the EFF is here,” he added.